Aspire Family Mediations Mediators are in Hemel-Hempstead. Contact us today to arrange a call back for any enquire about mediation or to book an assessment! Our office in Hemel Hempstead is ideal for anyone living in Berkhamstead, Kings Langley, Watford, Tring, Harpenden, Chesham, Rickmansworth and St Albans. The costs of divorce are very high if you decide to progress through a legal route. Solicitors can not provide an accurate quotation which will cover all of their costs. This is because they are trained to consider all of the legal aspects of a case. They can not pre-judge whether there may be complexities to a case which were not considered at the start nor can they consider how long certain processes will take. The way that solicitors work is to charge you for any advice, or additional services, that they provide. If a solicitor provides you with advice, no matter how minor that advice is, they will charge you for that advice. If a solicitor writes you a letter, makes a telephone call, or works on your case for a few minutes, they will charge you for that service. Solicitors charge in an honest manner, but they are always ‘on the clock’ in terms of charging you for each and every service that they provide. In contrast, mediation is a much cheaper alternative. All costs are included and costs are provided right at the start of the process. With mediation, you know what the costs are from the start, and can budget for these. Aspire made both of us realize how valuable and precious this relationship of ours’ is. Thanks aspire for showing is the right path again. I and my wife decided to get separated but, our main concern was the future of our kids. 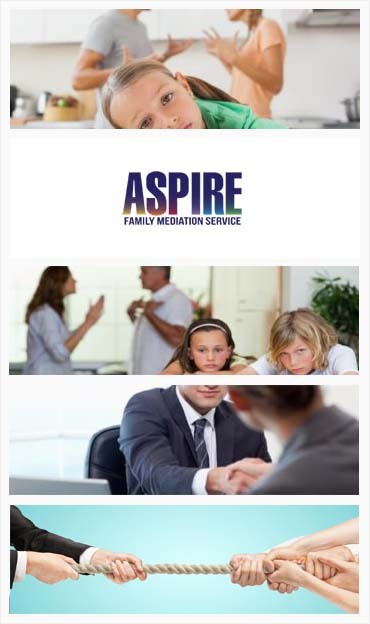 With the help of Aspire Family Mediation we found out a common solution and now we are not only living separately but, future of our children is also secured.